State Systems, Inc. has years of experience helping Mid-South restaurant managers meet their safety, fire protection, cleaning and technology needs. From fast food to fine dining, State Systems, Inc. can provide you with the tailored protection and technology solutions you need to protect and grow your business. With State Systems, Inc. on your side, you can return to your top priority: providing enjoyable dining experiences to your customers. To schedule service or request an estimate, call us today at 866-308-5701 or contact us online! We proudly serve restaurants and commercial kitchens throughout Tennessee, Mississippi and Arkansas. Properly installed restaurant fire suppression systems are a requirement no restaurant owner can afford to pass on. Putting out fires in a commercial kitchen is no easy task. There are countless flammable components in commercial kitchens, including cooking oil, gas, grease and alcohol, which can easily be triggered by the extreme heat produced from multiple ovens and grills. In such a hazardous environment, restaurant fire suppression system installation is especially vital. You’ll need a kitchen fire suppression system that can protect the numerous hazard areas in a restaurant and perform all the necessary auxiliary functions if fire strikes. At State Systems, we proudly carry and offer installation and maintenance services for ANSUL, Kidde and Pyro-Chem fire suppression systems. Commercial restaurant fire systems are guided by a process called saponification, which turns burning grease and oil into soap, stopping the fire quickly and making it easy to clean up. These systems are your best line of defense against potentially catastrophic kitchen fires. To better understand which restaurant fire system is best and most appropriate for your needs, call us or contact us online. A portable fire extinguisher is one of the best and most cost-effective defenses against property damage from a fire. When used properly, portable fire extinguishers save lives and property by putting out small fires or containing one until the fire department arrives. Restaurant owners throughout Tennessee, Arkansas and Mississippi must provide proper training in order to protect their employees and business from fire. The Occupational Safety and Health Administration (OSHA) requires employers to provide fire extinguisher training to those employees designated to use fire extinguisher equipment. In addition to fire extinguisher installation, State Systems, Inc. offers training services as well—call us or contact us online to learn more or schedule your training. Fire alarms are present and functional in less than one-quarter of all restaurant fire situations, while no alarm is present in almost one out of every five fires. 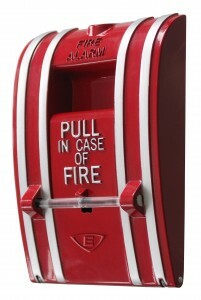 Fire alarm systems are the first response system for alerting employees and restaurant-goers to a fire or emergency situation. As such, keeping your system in proper working order is crucial for keeping everyone inside your restaurant safe at all times. At State Systems, Inc., we can design a fire alarm system that’s tailored to meet the fire protection needs of your restaurant and ensure everyone inside is protected. We offer fire alarm system installation and inspection services for restaurants throughout the Mid-South—call us at 866-308-5701 for more information. 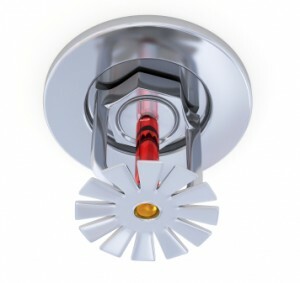 Automatic fire sprinklers have been saving lives and protecting property for more than a century. Restaurant owners and managers should understand that the installation of commercial fire sprinklers will allow them to continue running their restaurant without the constant worry of a potential fire outbreak causing serious damage. With automatic fire sprinklers properly installed in the restaurant—should a fire break out, minimal damage will occur. The sprinkler is activated when the ceiling temperature reaches a certain threshold—dependent on the sprinkler installation. Only sprinklers within the required temperature proximity will activate, minimizing the amount of water emitted. Contact us to learn more about our automatic fire sprinkler installation and inspection services. 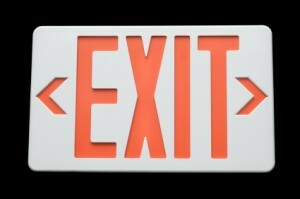 Exit and emergency lighting generally refers to emergency exit signs and emergency lighting fixtures. Exit signs and emergency lighting are required by local, state and federal building codes to ensure the safety of all building occupants. During emergency situations, exit signs and emergency lighting guide patrons to the nearest outdoor exit. As such, they are crucial components of any restaurant’s evacuation plan. The NFPA 101 Life Safety code describes the requirements for emergency lighting. Emergency lighting (when required) must be provided for a minimum of 1.5 hours in the event of failure of normal lighting. This safety code also requires that all exit signs and emergency lighting devices be inspected monthly and tested annually. The licensed technicians at State Systems, Inc. understand all the major requirements and guidelines set by OHSA and NFPA. Contact us for exit sign and emergency lighting installation or inspection services—no stress on your part, we’ll help you understand all the major regulations your restaurant must comply with. Keeping vent hoods free of grease and flammable residues improves ventilation for smoke and odor removal, reduces the risk of kitchen fires, may lower insurance premiums and ensures compliance with local and national fire and health codes. 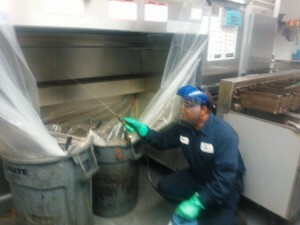 Here at State Systems, Inc., we offer vent hood cleaning services to all types of restaurants. No restaurant is too big or too small—we have the advanced pressure washing equipment and expertise to maintain professionally cleaned vent hoods. You can feel confident trusting us for your vent hood cleaning needs. Call us or contact us online for our advanced vent hood cleaning services. Now that you, your employees, and your customers can feel safe inside your restaurant, it’s time to focus on providing your diners an enjoyable, memorable experience. We offer restaurants—whether they are fast food or fine dining establishments—outstanding commercial digital signage solutions. Digital signage is the display of multimedia content on electronically controlled displays, most often for advertising purposes. A digital sign consists of a computer or playback device connected to a large, bright screen such as an LCD or plasma display. Digital signage has become a necessity for restaurants as a result of the world we live in today. Customers today are more pleased and impressed with multimedia communications. Restaurants, especially fine dining restaurants, depend heavily on word of mouth recommendations to expand business. Digital signage for restaurants is an outstanding way to promote positive word of mouth recommendations. Studies suggest that digital menu boards for restaurants increase the average margin per transaction and the sale of higher margin items, resulting in a greater bottom line. To take advantage of digital signage for restaurants, call us or contact us online.